A wonderful way to impress your clients or friends! Our chocolate casino gift boxes come in 3 sizes: Small, Medium and Large. 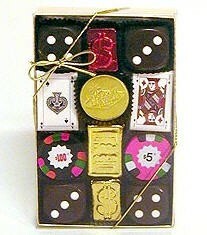 Our Medium Gift Box is filled with chocolate casino chips, dice, playing cards, coins and foiled dollar signs. Price per gift box is below.